Here, hot off the press so to speak, is today’s sermon. Imagine, for a moment, what heaven is like. We’re all going there, or so we believe as Christians – and we’re going to be there a long time – so what’s it like? Do you ever wonder what it will be like to be in heaven? Perhaps you’ve never thought about it much, but it’s surprising how popular recording artists have, over the years, thought about heaven and what it’s like. 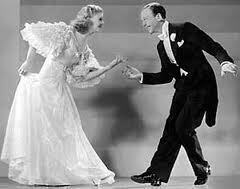 He was in heaven because he was dancing cheek to cheek with Ginger Rogers in the 1935 film Top Hat, and sang about it in that wonderful Irving Berlin song. Though, and the Strictly Come Dancing fans among you will know what I’m talking about – the infamously critical judge Craig Revel Horwood would probably think that most of the contestants were a long way from heaven when dancing cheek to cheek. You can imagine what Irving Berlin might have thought of that. and ‘Jaws’ one, two and three. There’s gifts for all the family. Imagine there’s no heaven, it’s easy if you try. Today, for the feast of All Saints, we are given a reading from the Revelation to John that gives us a picture of what heaven will be like. And it’s a picture rather like our great stained glass window behind the high altar. Our window is a picture of heaven, with its image of Christ in glory surrounded by patriarchs and prophets, of saints – some well-known and others less so. It’s a wonderful window, and worth a fortune. And yet, it’s a very stylised picture – I don’t for a moment think that heaven which actually look like that. Our picture of heaven in the reading from Revelation is much the same – it’s a stylised picture, trying to tell us something about the wonder of heaven with God seated on his throne at the centre worshipped by those who surround the throne. And while none of us knows what heaven will really be like, I don’t think in reality it will be like that. If our East window is an accurate picture of the saints in heaven it doesn’t seem very inspiring. And yet – we are called to be saints. Saints, who one day will join the great eternal banquet, the never-ending party that is heaven, where although we presumably won’t all be dancing cheek-to-cheek we will be enjoying ourselves, unlike the saints in the East window. Today’s gospel reading is one of the most familiar passages from the Bible. Jesus claims authority to teach, by assuming the seated position of the teacher – teachers in those days sat to teach, rather than standing in front of people. And in setting this collection of teaching upon ‘the mountain’, Matthew invites the comparison of Moses, the lawgiver, with Jesus, the giver of the new law. Although clearly significant, it is not immediately clear how to interpret Jesus’ teaching. It is difficult to translate the Greek word makarioi which, translated as “blessed”, begins each of the beatitudes. Originally used of the Olympian gods, by Homer, it came to be used in Greek culture to mean ‘how fortunate’, or ‘how lucky’. But that’s not what Jesus means. He doesn’t mean you’re ‘lucky’ if you’re persecuted or mourning. Some modern English translations offer ‘happy’ as an appropriate English rendition – but that doesn’t seem right either. However, Jesus’ use should be drawn from Hebrew tradition. Take Psalm 1.1 for example, such as Ps 1.1, “Happy are they who do not follow the advice of the wicked … their delight is in the law of the Lord” where ‘happy’ is used to mean being ‘right with God’ (an objective relationship) rather than being about ‘how I feel’ (a subjective state). It suggests that you are blessed, happy, because of what God has done for you – not because of something that you have done yourself to make yourself ‘feel’ blessed or happy. Well, is this objective blessing promised by Jesus something we experience now or in the future? Is it for this life or the next? The other passages set for this Sunday indicate future blessing – a future resolution of today’s difficulties. But is there no present benefit of faith in Christ? There is, at least, a present assurance of a future promise, to call believers to a distinct perspective upon life. For the kingdom of Heaven is found in the present and the future experience and reality of peace, of ‘shalom’: of a right relationship with God and one another which may only be found in Christ. It is given, not earned. If you look at the Old Testament you will see that there is ample indication in the Hebrew scriptures of God’s blessing upon the poor and his distaste for the rich – it’s a theme which comes up time and again. And yet, riches were nonetheless the assumed sign of God’s blessing – Jews thought at the time of Jesus that the richer you were the more God had blessed you. If you were poor it must be your fault that God hadn’t blessed you. It’s a view which is still around today in many Christian circles. Jesus resolves this tension between the message of the Scriptures and what people actually believed by reaffirming God’s preference for the poor, who turn to him for mercy and in so doing re‑establish the heart of the divine kingdom which is utterly reliant upon God. He reaffirms God’s preference for those who are prepared to suffer for righteousness, for those whom the world might consider unfortunate and worthless. These qualities expressed in the beatitudes, described with approval, challenge many of our presuppositions of the signs of God’s blessing. Each one commends those who presently suffer in weakness, for their resolution will be at the hands of God. On All Saints’ Sunday we need to see that we – and not just those portrayed in our stained glass windows – are the saints. The beatitudes describe as ‘blessed’ the lives of those who struggle, and suffer, and know their weakness. These are not the lives of stained glass, or plaster saints, but the lives of real people learning to rely on God in their everyday successes and failures, working together for that day when God’s purposes will be finally revealed. Do we know that we are reliant upon God for true happiness – that it cannot be realised by our own efforts through amassing worldly riches? As followers of Jesus we can know ourselves accepted by God’s grace – know ourselves to be fully accepted, blessed, truly happy in the sense that Jesus meant. For we are members now of his family of saints ‑ with our membership guaranteed not by what we have done for him, but by what he has done for us. And we are challenged to live out this truth of our lives ‑ that we are children of God ‑ as a response to what Jesus has done for us, knowing that our present experience may be one of struggle, but encouraged by the future hope of eternal life in with God and one another. And as we live that out we discover that not only are we promised a place in heaven in the next life, but that we can begin to make heaven a place on earth. But having no voice, I’ll be clear of the singing.